South Africa’s “John Platter Wine Guide” was tonight recognised as the world’s best. 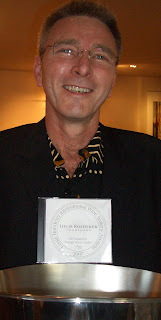 Editor Philip van Zyl (pictured left) was in London to accept the Champagne Louis Roederer International Wine Writers ‘Domaines Ott’ Award for best Annual Wine Guide 2007. Philip told me that that while he was delighted and thrilled to win the award, he accepted it on behalf of a dedicated team that has been working hard tasting and rating some 6000 wines in order to produce the guide. Louis Roederer Champagne flowed in the heart of London’s theatre land as we celebrated the win. All, that is, except one man. Philip van Zyl declined his place at the award winner’s dinner in order to make last minute checks of the 2008 Guide. He was in London for this one night only – tomorrow he flies to Singapore with the manuscript of the guide and will spend the following week closeted with the printers and checking tproofs. Philip van Zyl’s award consisted of a large engraved silver Champagne bucket, a magnum of Roederer ‘Cristal’ Champagne in a presentation box and a substantial cheque. “We will be having a real party when I get home,” said Philip. The panel of judges were Steven Spurrier (chairman), president of the Circle of Wine Writers; Christine Austin, wine writer, wine editor of The Larousse Gastronomique and winner of the Louis Roederer regional wine writer award 2006; Deborah Collinson of Deborah Collinson & Associates; Matt Harris, managing director of Planet of the Grapes; Charlotte Hey, publisher and editorial director of The Drinks Business and Helen Lederer, comedienne, writer and actress. **EXCLUSIVE** You read it here first!